A big change to the Public Holiday settings today, one that will suit those with departments or offices in different countries. For those questioning why those countries, it's a combination of countries from which our customers are signing up and a reliable list of Public Holidays available. You'll notice that "Public Holidays" has been removed from the settings menu. 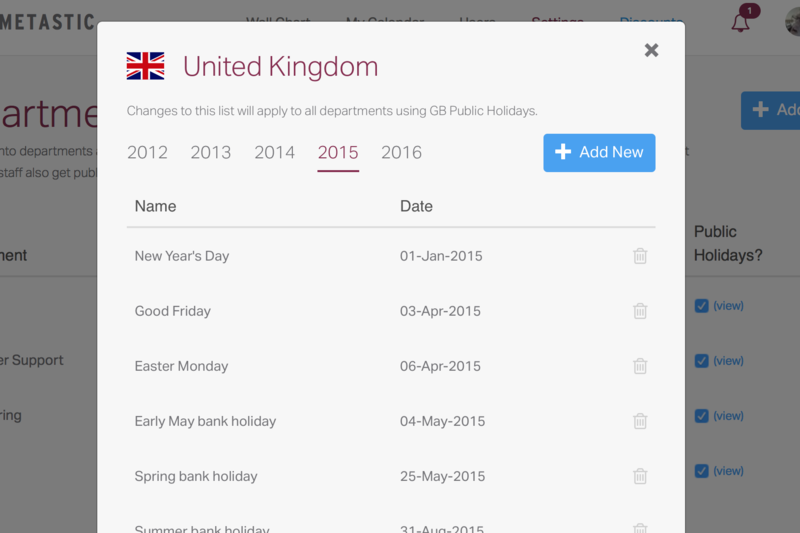 This is because you'll now find the functions sit nicely within the "Departments" section. The appropriate list of public holidays is now determined by the departments location (note the new 'Location' selector). You also have a check box which determines if the public holidays should be allocated to the department or not. The actual list of Public Holidays can be viewed and edited if necessary from the "View" link. Even though we now support 17 different countries we believe the whole process is smoother than the previous version, we hope you agree.